Technically flawless is the only way to describe Friday evening’s performance at Rackham Auditorium by pianist Wu Han, violinist Daniel Hope, violist Paul Neubauer, and cellist David Finckel of the Chamber Music Society of Lincoln Center. Each of the performers are highly accomplished musicians in their own right – just to give you an idea, Mr. Neubauer was appointed principal violist of the New York Philharmonic at age 21, and Mr. Finckel was the cellist of the Emerson String Quartet for 34 seasons. As a group, their music-making demanded the audience’s attention from the very first note, refusing to relinquish it until the concert’s conclusion. The program consisted of piano quartets, which, counterintuitively, consist of a piano, violin, viola, and cello. The first piece, Quartet in a minor for Piano, Violin, Viola, and Cello, Op. 1 by Josef Suk, was written by the composer when he was a seventeen-year-old student of Antonín Dvořák. With a dramatic first movement, ethereal and dreamlike second movement that fades into nothingness, and a third movement that is jarring, the piece concluded to rapturous applause. The second piece, Johannes Brahms’s Quartet No. 3 in c minor for Piano, Violin, Viola, and Cello, Op. 60, was one filled with an underlying tension that never quite left the music, even during the sections that could be described as more tranquil. It was during this piece that I specifically noted Ms. Han’s skill on the piano – her fingers seemed to dance across the keys with extraordinary lightness. The final programmed piece was Quartet in E-flat Major for Piano, Violin, Viola, and Cello, Op. 87 by Antonín Dvořák. However, the audience, thoroughly captured by the evening’s performance, called for and was granted an encore of Dvořák’s Bagatelles, Op. 47, V. Poco allegro. The piece was announced from the stage. It was noted, to the audience’s amused laughter, that Dvořák composed it when his publisher insisted that he work on something more popular than what he had been working on (he had been working on his Slavonic Dances, which are famous even today). After the concert, the performers came out into the lobby of Rackham Auditorium to sign albums and interact with audience members. It is always fascinating to hear artists discuss their work, which is not usually an opportunity after classical performances! 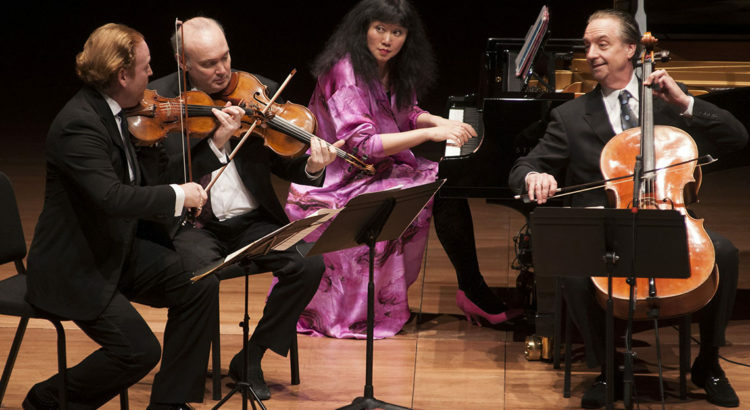 Overall, the Chamber Music Society of Lincoln Center presented an evening of music of impeccable quality that was greatly enjoyed by the audience!